One of the most fascinating genealogical tasks is reading old wills and inventories. For a start, there is the humbling recognition that the goods and chattels of even a well-to-do householder, right up to the eighteenth centuryy, could be listed on a single page. The will o r inventory of a Tudor or Stuart yeoman (or his widow) often takes us room by room around his house and outbuildings, enabling us to peer through the windows and see what kind of bed he slept on, what he wore, what he ate his food with, and even into the corners of the lumber rooms where miscellaneous and unnamed ‘thinges’ lurked. Silver utensils, being of special value, were often described in some detail. A wealthy Cornish yeoman of the parish of Saltash in 1581 left his wife, among other things, a dozen silver spoons ‘called by the name of the mayden head’; after her death, they were to be passed on to her daughters. Maidenhead spoons – that is, spoons with a filial in the form of a female head – feature in inventories from the fourteenth century. The examples that survive – both in the documents and in reality – are usually silver, but no doubt there were wooden spoons that were similarly carved. It has been suggested that they might have been wedding gifts. 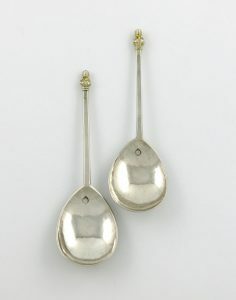 The expression ‘born with a silver spoon in his mouth’ reflects the importance of the silver spoon as a mark of status and in particular of inherited wealth. Precious as they were, it might have come as a surprise to the yeoman in question that a few centuries later, his maidenhead spoons would have fetched thousands of pounds. 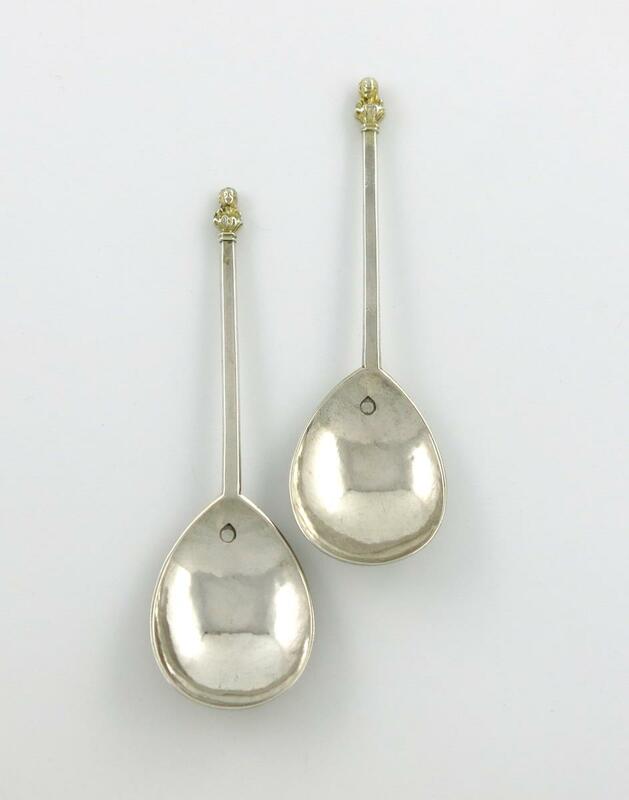 A pair of Elizabeth maidenhead spoons, made ca 1580, was valued at between £5,000 and £7,000 in 2016. The minute size of a spoon filial was a challenge to the craftsman. Similar images, in wood and stone, are found in abundance in medieval church decoration, where the larger size allowed for a greater breadth of treatment. Like other traditional forms of decoration, the maiden’s head had a symbolic meaning. An inventory from Durham Priory (1446) makes it clear that two of its spoons (which were perhaps used liturgically for incense) had ‘the image of the Holy Mary at their ends’. Over time, as with other emblems, generations of craftsmen adapted the image as they chose, so that some of the female heads on the ends of spoons were not obviously maidenly. Small wonder that, come the revolution, a new fashion for Puritan spoons emerged, with plain lines and no decoration. T Kent, West Country Silver Spoons and Their Makers, 1550-1750 (J H Bourdon-Smith Limited, 1992). C M Woolgar, The Culture of Food in England, 1200–1500 (Yale University Press, 2016). Roberta Gilchrist, Medieval Life: Archaeology and the Life Course (Boydell Press, 2012)..
Online catalogue, The Metropolitan Museum of Art, New York. Woolley & Wallis, Salisbury: www.woolleyandwallis.co.uk. J H Bourdon-Smith, London: www.bourdonsmith.co.uk.